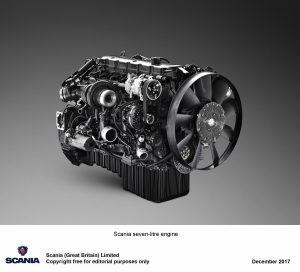 Scania has added an all new 6.7-litre engine to its range. It is available in three power outputs – 220, 250 and 280 horsepower – and is aimed primarily for urban operations. Scania says its key features are it its highly fuel efficient combined with excellent driveability, low weight and low noise. In addition, when specified in conjunction with Scania Opticruise, the compact size of the new unit enables a G-series cab floor to be used in P-series models, thereby providing a 95mm lower engine floor and greater storage space. The new 6-cylinder in-line engine has been developed together with Cummins, a long-term component-development-partner of Scania. The engine has good low-rev characteristics, a fixed geometry turbocharger, and uses only selective catalytic reduction (SCR) for the exhaust gas after-treatment for Euro 6. The unit is significantly smaller in size than Scania’s existing nine-litre engine and weighs approximately 600kg, a saving of 360kg compared with the nine-litre unit. Andrew Jamieson, Sales Director for Scania (GB) said: “The introduction of this new engine platform, together with the other initiatives we are announcing at this time – the Scania L-series low-entry cab and the City Safe Window – considerably boosts our urban vehicle programme. “Furthermore, in accordance with our stated policy to drive the shift towards more sustainable transport solutions, the new engine is certified for use with 100% HVO (Hydrotreated Vegetable Oil), a biofuel which gives a carbon dioxide reduction of up to 90%.